One person can make a difference. Will you be that one person? “Touch is not just a private act. It is a fundamental medium for the expression, experience and contestation of social values and hierarchies. The culture of touch involves all of a culture.”1 Clara McBride Hale of Harlem had a gifted sense of the vitality that touch brings to babies in need of nurture. Hale had been a widowed mother of two since the sudden death of her husband when she was only thirty-three. When she died at eighty-seven, she had become known as “Mother Hale,” not for the biological children she had reared, but for the tens of children she had cared for first as a giving and resourceful neighbor then as a foster parent beginning in 1940.1 At her death in 1992, Mrs. Hale had been praised by an American president and feted by fifteen colleges and universities. She was a nurturer to the babies of substance addicted mothers and still later to HIV infected infants. During the urban crack crisis of the 1980s, Mrs. Hale’s children joined her in her work and it continued to grow. Mother Hale gained local philanthropic support. An early donor was fellow New Yorker and ex-Beatle, John Lennon.5 Local officials began to provide policy waivers to allow her group home for babies. Later came national television coverage. Her care for abandoned, crack addicted infants brought the attention of President Ronald Reagan during the 1985 State of the Union Address. In the 1990s, orphans came to Hale House. They were left behind by an unnamed disease that had taken the lives of their parents. The disease came to be called AIDS. Our lesson from the testimony of Mother Hale’s life is that the care of one individual can make a difference. And it can become contagious. Her desire to simply love children left a legacy that today is Hale House, a child development center that also provides transitional housing. Without the proof of an expert’s education and scientific studies, Mother Hale intuitively knew that loving touch provides the reassurance that helps a child to survive the most difficult of beginnings. What a great lesson for those who work with struggling children. What a great lesson for those of us who want to make a difference in the global fight against HIV/AIDS. We can reach out physically to those in our communities and financially to those in countries such as Africa that are so devastated by the AIDS crisis. One person can make a difference. Will you be that one person? Advent is the promise of the coming Savior that suggests God’s openness to love all humanity. Our response is to offer the same to others in a word of encouragement, with a smile, or with a touch. They grace and love in us reveal. When HIV/AIDS was first discovered, the mystery of its origins and mode of transmission caused early patients to be disconnected from humanity, in large part because they went without touch from other humans. Today, persons living with AIDS still need to be touched as do others in our congregations. These choruses from popular songs remind us of the power of touch from Jesus himself as well as the sense of the same from those around us. A friend who was accustomed to a more stoic form of worship than the lively worship at my “down home,” traditional African American Baptist church admitted that one of her favorite reasons for attending our worship service was the welcoming of the visitors. Dedicated to urban ministry and located in the inner city where homeless persons regularly walked in off the streets, the pastor instructed us to “Make sure everyone gets a hug.” At the end of, our version of the ritual passing of the peace, he asked for assurance: “Did anybody NOT get a hug?” If anyone had to admit to being overlooked, the pastor and members of the congregation had another opportunity to correct our collective error of omission. For any number of reasons, too often we do not wish to risk sending an unintended message, so we may choose to eliminate touch—even within the faith community. To be sure, sometimes a person who may be touch-starved11 or who associates touch only as related to sexual activity, may occasionally reach out inappropriately. But how are they to be taught without instruction? Some schools no longer allow teachers to touch primary grade children.12 Instead, children are taught about “bad touch.” Good defense, yes. But it is not the only sort of touch they can learn to experience. Restore touch in the life of your faith community and explain its importance as a measure for surviving and thriving for children and adults. Remind the congregation of the healing power of touch in Jesus’ ministry. Focus on touch as an imitation of the Christ. Encourage occasional handholding during corporate prayer or at the benediction or in the exchange of a hug between Sunday school classmates where relationships have an opportunity to become more intimate, especially in a large congregation. Contemporize understanding. Touch is too often associated with violence and is overused to operate technology rather than to connect people to each other.14 Take the taboo out of touch. Also, importantly, remember those around the world suffering with AIDS who can be healed if we will touch them with our financial generosity and advocacy for global AIDS policies that uplift the most down trodden. This year, for World AIDS Day, why not fight for something instead of against so much—fight to touch others from your corner in the world. 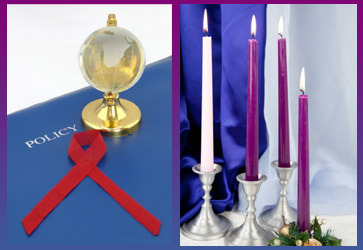 Balm in Gilead, Inc. (http://www.balmingilead.org) is an ecumenical faith community not-for-profit that seeks to reduce the incidence of HIV and AIDS in the African Diaspora. The Black AIDS Institute (http://www.blackaids.org/) is an HIV/AIDS policy center that aims to reduce the epidemic of the HIV/AIDS health disparity. Their motto describes a commitment to self-preservation: "Our People, Our Problem, Our Solution." The Centers for Disease Control (http://www.cdc.gov/Features/BlackHIVAIDSAwareness/) offers health statistics, health information, and strategies to educate people about HIV and AIDS in the United States. 1. Classen, Constance. “Fingerprints: Writing about Touch.” The Book of Touch. Ed. Constance Classen, Oxford: Berg, 2005. p. 1. 11. Field, Tiffany. Touch. Cambridge, MA: MIT Press, 2001. Field describes the notion of “touch hunger.” By referring to touch starved, I am extending the severity of her concept. 14. Ibid., p. 13. See Figure 1.6.